The German optics specialist is extending its binocular and spotting scope segment with two new compact binoculars from the successful BV line. Waterproof, with optional 8x or 10x magnification, the MINOX BV 8x25 and BV 10x25 are compact binoculars designed for universal application. They are particularly valuable companions when handy and lightweight baggage is required  whether for traveling, sports, hunting or observing animals and plants. Boasting an exceptional price/ performance ratio they are also the perfect choice for those looking for a high-quality, yet still affordable gift. 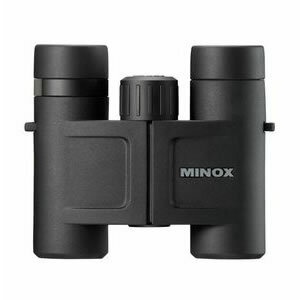 When it comes to technical features compact binoculars from MINOX rank in a class of their own! Thanks to the modern optical system the BV 8x25 and BV 10x25 guarantee unadulterated viewing enjoyment with high image contrast and excellent detail rendition. All glass/air surfaces feature a multicoating for maximum light transmission and stunning brilliance of the image without interfering reflections. The extremely sturdy aluminum body ensures reliable functioning of all optical systems and precision mechanics on the inside. An innovative sealing technology provides protection against dust and water. The BV 8x25 and BV 10x25 withstand moisture penetration up to a pressure of 0.3 bar or a comparable water depth of three meters. This also makes them suitable for extreme wind and weather conditions. Nitrogen filling of the binoculars ensures permanent protection against corrosion and prevents fogging of the glass surfaces on the inside, even with severe and sudden temperature fluctuations. With their extended eye relief the new binoculars of the BV line ideally meet the individual requirements of people wearing eyeglasses, enabling them to enjoy the entire field of view without vignetting. Twist-type extendible rubber eye cups for setting the interpupilary distance are another convenient feature. The central joint mechanism enables fast individual adjustment of the distance between the objective lenses. The aluminum body has non-slip rubber armoring giving the new compact binoculars from MINOX a good and safe hold at all times. Magnification: 8x  Front lens diameter: 0.98 inch, 25 mm  Exit pupil: 0.12 inch, 3.1 mm  Field of view: 358 ft at 1000 yds, 6.8°  119 m at 1000 m, 7.4°  Eye relief: 0.61 inch, 15.5 mm  Close distance: 4.92 ft, 1.5 m  Twilight factor: 14.1  Operating temperatures: 14° up to 104° F, -10° up to +40° C  Waterproof: yes, down to 9.84 ft, 3 m  Dimensions (H x W x D): 4.29 x 3.85 x 1.53 in, 109 x 98 x 39 mm  Weight, approx: 9.14 oz, 259 g  Features: Nitrogen gas filling, Phase-corrected prisms. Magnification: 10x  Front lens diameter: 0.98 inch, 25 mm  Exit pupil: 0.098 inch, 25 mm  Field of view: 290 ft at 1,000 yds 5.5°  196 m at 1,000 m 5.5°, 7.4°  Eye relief: 0.61 inch, 15.5 mm  Close distance: 4.92 ft / 1.5 m  Twilight factor: 15.8  Operating temperatures: 14° up to 104° F, -10° up to +40° C  Waterproof: yes, down to 9.84 ft, 3 m  Dimensions (H x W x D): 4.29 x 3.85 x 1.53 in, 109 x 98 x 39 mm  Weight, approx: 9.14 oz, 259 g  Features: Nitrogen gas filling, Phase-corrected prisms.